Book now and save$50 on rent - if paid in full by April 30, 2019 [also saves on taxes too!]. 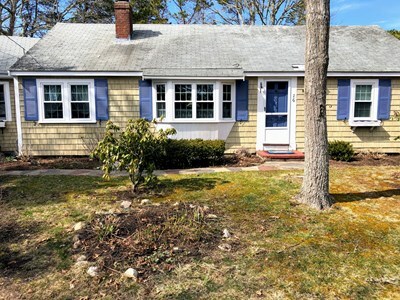 This quintessential Cape home is bright, sunny, and spacious, with huge yard and off-street parking [4 cars maximum]; located just south of Route 28 and a mile to a Nantucket Sound beach. Access to the Swan River for kayaking - rent one nearby or bring your own and drop it in - takes you right out to the ocean; or grab your bike or rent one and hit the Cape Cod Bike Trail - about a mile from the house. This bright, sunny, smoke-free, updated ranch home is in a quiet neighborhood with one step up key-less entrance. 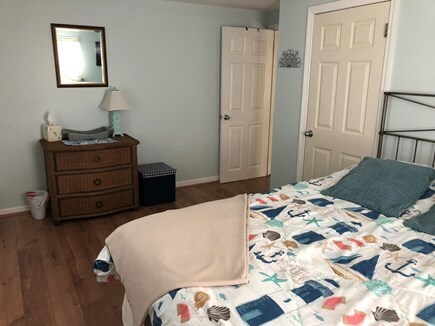 The home has it all - central air conditioning, outdoor shower, patio, private master bedroom with a king bed and 1/2 bath en-suite, and laundry on the main living floor. 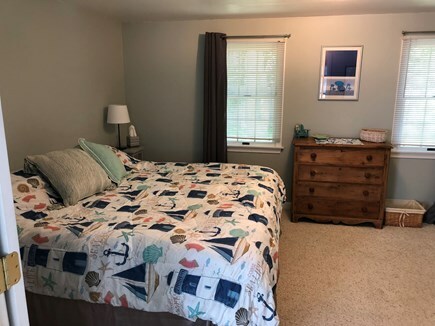 There are 2 additional bedrooms - 1 with a queen bed and 1 with full bed and twin bed adjacent to the full bath [shower only - no tub]. 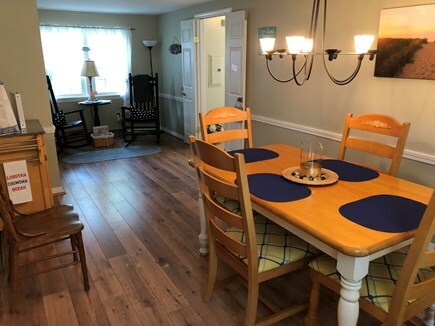 An eat-in dining area leads to the patio, and the kitchen has quartz countertops with an electric stove, dishwasher, full-size fridge, coffee maker, Keurig, toaster, and microwave. Plenty of pots, pans, and cooking utensils if you like to cook. The living room has 2 sofas and a comfy chair and ottoman for relaxing after the beach. Games, books and puzzles are there too. 39'' Roku TV with basic cable - watch Netflix or Hulu or pick a movie from the DVD library to watch. The house has WiFi with good reception. 6 Beach chairs are provided. Additional pricing info: Discount offered for 2 week stay or more; cleaning fee $175, insurance $69, pet fee $100, State and local taxes of 12.45% will apply. 1 step up to enter/exit - ranch one level home - all bedrooms, bathrooms, laundry in unit on first floor next to bathroom. We enjoyed our stay at Two Feet in the Sand tremendously! The house was perfect for our family. The owners could not have been more helpful and accommodating. And there was an outdoor shower!! I had missed that info when I booked our stay, so that was a very welcomed surprise! We will be back next time we visit the Cape. 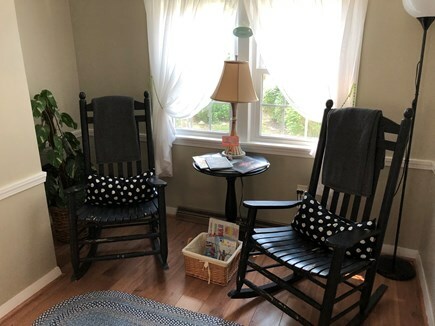 Hi Elizabeth - so glad you enjoyed your stay at our beach cottage and will look forward to hosting you again the next time you come to Cape Cod. And yes, that outdoor shower is amazing - such a great feeling. 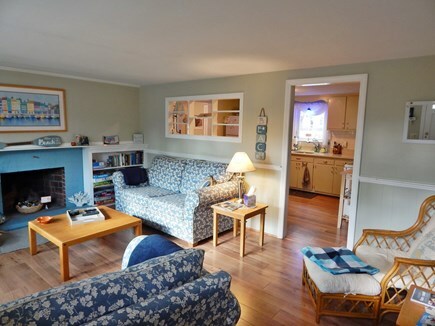 Lovely Home Close to West Dennis Beach! We had a great stay at your home! The location to everything was great, short walk to Dunkin Donuts and ice cream shop. Lovely little neighborhood for walks with the dogs. Very quiet for relaxing in the large yard. Quick response to any questions. Hi Patty - we are so glad you had a wonderful stay at "Two Feet In the Sand". The location is very convenient and still off the beaten path - something for everyone. We are fortunate to have such a great neighborhood and be so close to the beach. The added bonus of the private, spacious back yard makes it come full circle so you can enjoy the evenings on the Cape. Hope to see you again next year. You open the front door to a bright, sunny, comfortable feeling that just wraps its arms around you . 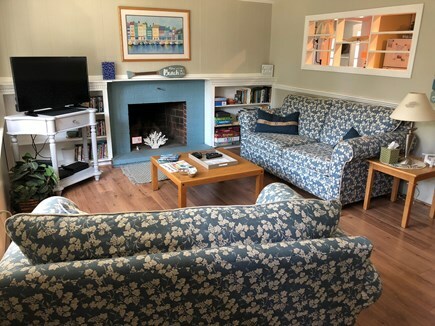 The cottage is so clean, decorated very happy, cheery, all beach decorations and the owners put love and care into every square inch to make our stay comfortable. The kitchen is great, living room very comfortable, bedrooms are clean and comfortable, the outdoor shower was like heaven, the very large, private yard and patio were perfect for sitting and having outdoor dinners each night after cooking on a great grill. We walked to famous seafood, old fashioned ice cream, homemade waffle cones, kayaking across the street, and a quick 4 minute drive to beautiful West Dennis Beach where we spent every day, bike riding on the Cape Cod trail, 10 mins down the road was so fun and exciting! A very quiet neighborhood, but then off the main road is every single activity you could desire! Hi Jane - we are so glad you felt at home at 2 Feet in the Sand. Our goal was to make it an oasis - because vacation is supposed to be different from every day life. Thanks for the feedback.. We fell in love with the house for all the reasons you listed. Hope you’ll be back next year. We are so glad you and your family had such a great time at our home - 2 Feet In the Sand - recently. And thanks for the feedback about pots and pans - we got the house together so quickly for renters we didn't have enough time to fully stock it for people who cook but we will get there. Agreed - the outdoor shower is probably one of our favorite features too. Hope to see you next year (if not sooner). 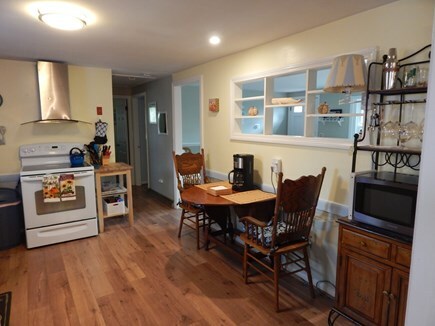 The house is very clean and centrally located for all Cape Cod adventures. Nice private backyard patio & garden area for morning coffee. This property "Two feet in the sand" is beautifully decorated with a beach decor. The house is fully stocked with all the extras. The owners were amazing to work with and we will definitely be back. We are so delighted to hear that you had a wonderful vacation and enjoyed your stay at our home “2 Feet in the Sand”. Thank you and we hope to see you next summer. We had an excellent getaway at this beautiful home in West Dennis. Convenient location, clean, comfortable and just a couple of minutes from the beach. We'll definitely be back for another stay, highly recommended! Thank you, Kelly and Jen. We are so glad you enjoyed your stay at 2 Feet in the Sand. We hope to see you again soon. Welcome to Two Feet In the Sand established in 2018! We started our family vacations 18 years ago on Cape Cod with our two small children. Today we are the owners of this beautiful cape home and we want to share it with you. Great memories are here to be made - building sand castles, watching Cape League baseball games, kayaking on the Swan River, eating ice cream, biking the rail trail, antiquing and so much more. 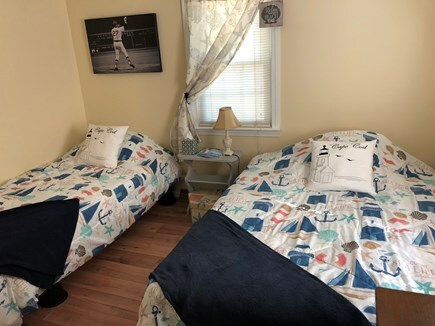 Whether you are a young family or a couple looking for a get-away - this home has it all and we know you will enjoy being close to the beaches, and in the heart of Cape Cod. We want this to be your home away from home. 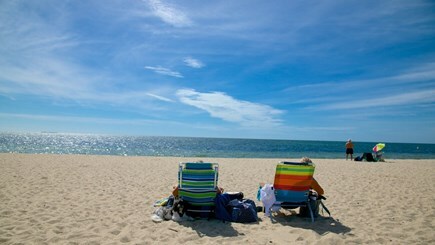 Who knows maybe you will make the plunge and buy a slice of heaven here on the cape too - we did! This spacious, sunlit, airy 3 bedroom home has central air conditioning, washer/dryer on the living level, 1 1/2 baths, outdoor shower, sleeps 6 [1 double, 1 queen, 1 King, 1 twin, 2 sofabeds]. 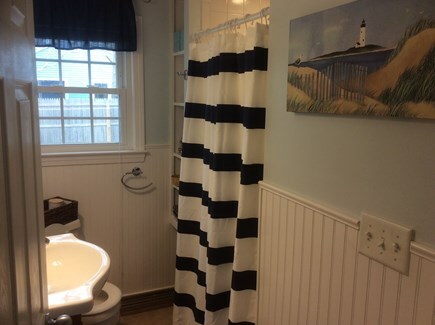 It has a huge yard and is 1.2 miles to Nantucket Sound beaches with ample parking, restrooms and snack bar. The Swan River is across the road for easy access for kayaking. The Rail Trail, shopping are close by and you are a short walk to the Kream and Kone, Dunkin Donuts and more. The home has lots of books, puzzles, games and a DVD library for movie night too. 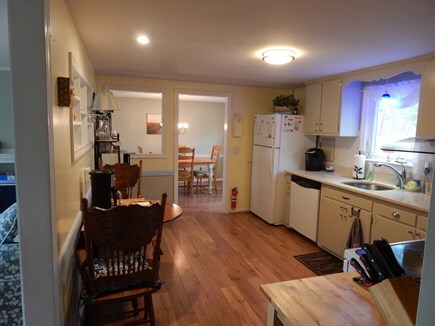 Great kitchen with dishwasher, electric stove and full fridge - so you can cook or you can eat out. A gas grill in the backyard with an outdoor shower, picnic table and lots of seating. Great yard to lounge in and play lots of backyard games. Dogs will be considered - please let us know in your request. Dennis MA is a great location - mid Cape so easily accessible to all areas north, south, east and west. There is Route 6A for Antiquing and lots of conservation trails. Dennis has great beaches on both sides and is one of the only towns on the cape to be on the Bay Side and the Nantucket Sound side. There is theater, Cape League Baseball, terrific shopping - and all the comforts of home right off the highway. There is something for everyone.